You are here: Home / Custom Wrap Designs / Wrap Knowledge. How Long Does a Car Wrap Last? How long does a car wrap last? This is the question everyone asks. How to improve a car wrap’s longevity. How to maintain and care for a wrap. These questions have many answers. Common guesses give ranges from five to seven years depending on whom you ask. But this is not necessarily true. Proper maintenance and care will lengthen your car wrap’s life. But let’s start with the basic underlying foundation…the vinyl. 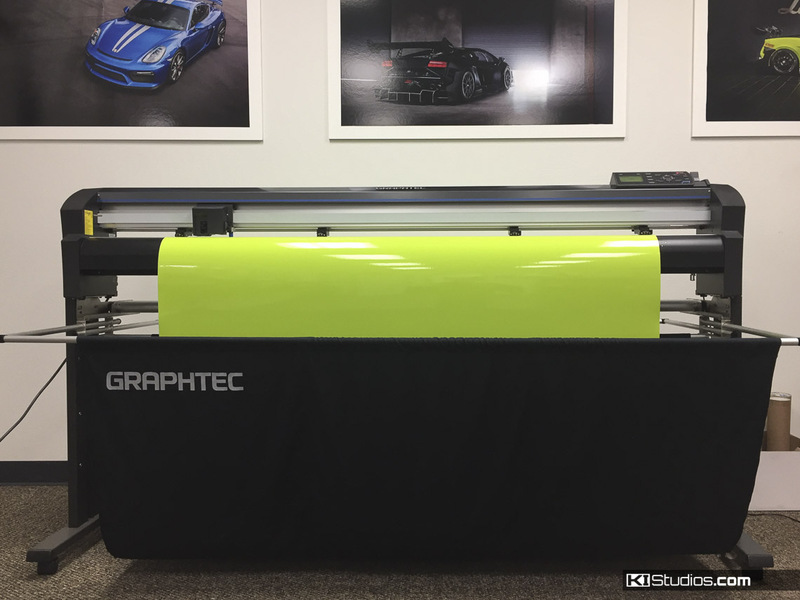 In the car wrap industry, there are two big vinyl suppliers: Avery Dennison and 3M. 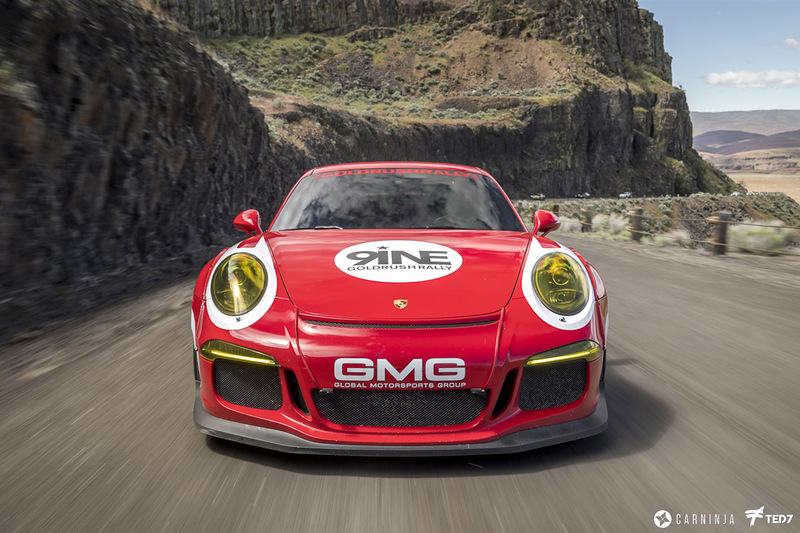 Avery Dennison offers their Supreme Wrapping film SW900 that claims to have durability lasting up to 12 years. But reading more into the fine print, there is variation amongst the product line. Avery Dennison first defines and states that durability and warranty are one and the same. Avery’s warrant documentation references their durability chart multiple times. The chart is broken down into zones. For this I am going to focus on our local zone of the United States of America. In the durability chart there is a small distinction referencing desert states. The importance of this is that later in the chart, the warranty does in fact exclude desert areas. These are regions such as Arizona, Nevada, and of course California. What that means is that for cars residing in harsh environments, there is no warranty on wrap vinyl. While Avery-Dennison’s warranty policy makes distinctions for vinyl placed on either horizontal or vertical surfaces, this really doesn’t help us much since a car has both types of surfaces. We’re are of course concerned about the entire look of a car. Now, let’s see what 3M’s warranty policy is on their 1080 Wrap Film Series. United States exposure reduced warranty period is 3 years for vertical surfaces, again very little of which is on a vehicle. This doesn’t help us much because we want the horizontal surfaces to last as well. The warranty period for horizontal surfaces is 35% of their 3 year limited warranty, equating to just over one year for all/only horizontal surfaces. But wait, there’s more. Yes, we special Californian’s get our own horizontal desert southwest exposure warranty. This period is 0% of the limited 3 year warranty. You read that right… Zero percent! Long story short, there is no warranty here in California for either manufacturer. Now understanding warranty policies directly from manufactures, we still need an answer. 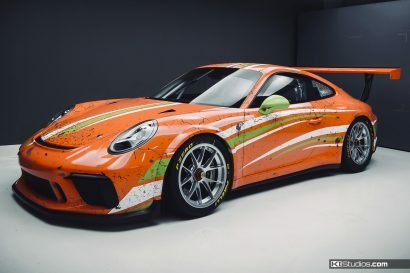 A vinyl car wrap is considered temporary. How temporary? How long will a car wrap last then? If there is no warranty for a car wrap, how long will it last then? For hard-working commercial vehicles, knowing how long a wrap will last is key. The answer to a car wrap’s longevity depends on many factors. These include things like sun exposure, frequency of washing, and more. If your vehicle is out in the sun at work all day or in the driveway over the weekends, the wrap will last a shorter amount of time. A daily driven car exposed to constant sun and heat will last approximately 2 years at most. If you happen to park in the shade usually, this could potentially increase durability to 3 – 4 years. If your vehicle is garaged during the week and driven only on weekends, the good news is your vinyl wrap should last around 5 years or more. In general, proper care and maintenance is the correct way to increase the length of your wrap. But still wanting more, you can add a protective coating that will increase the vinyl’s durability. 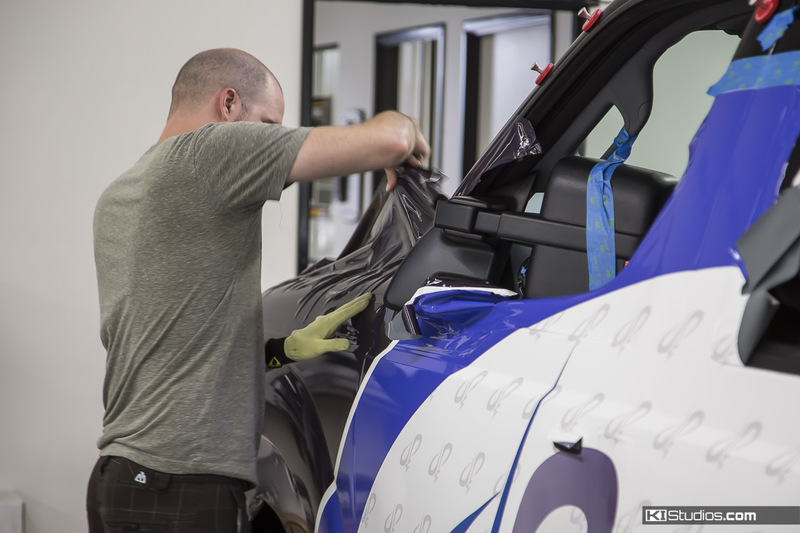 Increasing Your Car Wrap’s Durability With a Protective Ceramic Coating. The solution to the big question is finally here… Ceramic Pro PPF & Vinyl. Ceramic Pro is the world’s leading nano-technology ceramic coating. This coating is permanent and will fill in all the tiny pores in vinyl. 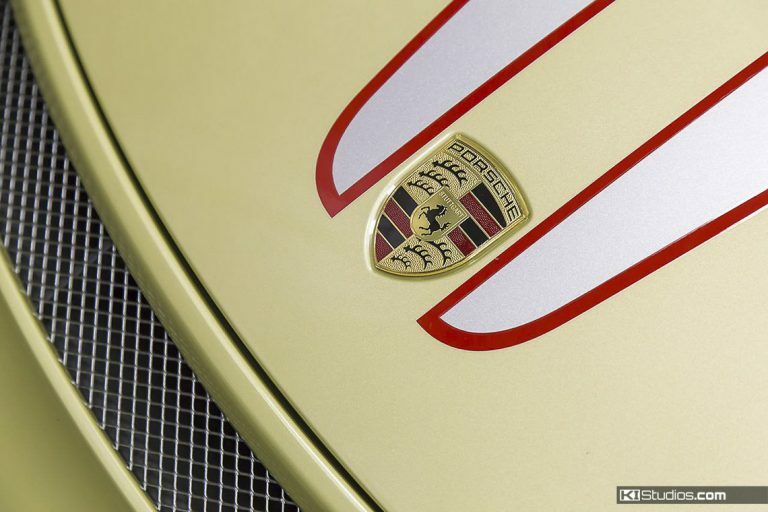 This will make your car wrap hydrophobic and super-slick so that nothing sticks to it. The bottom line is that Ceramic Pro will increase the lifespan of your car wrap under any circumstance. Yes, the details mention earlier in this article still apply – A garaged weekend car’s wrap will last longer than one that’s daily-driven. But that said, across the board, Ceramic Pro will increase this durability substantially. Ceramic Pro PPF & Vinyl’s warranty is dependent on the warranty of the base substrate. This means that it cannot have a warranty past that of the of the surface it’s applied on. This means that Ceramic Pro PPF & vinyl applied to a car wrap has no warranty in California, because the wrap vinyl itself has no warranty. But applied to Xpel or Suntek PPF, it would carry the warranty those carry. 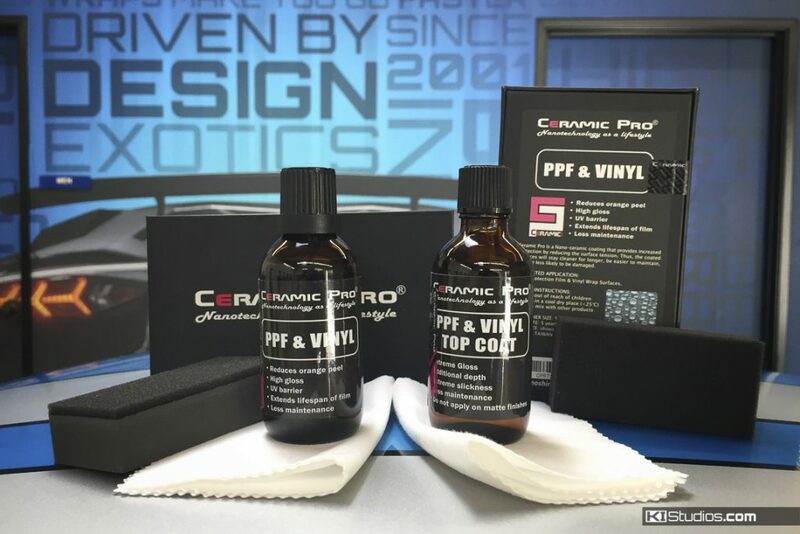 Ceramic Pro PPF & Vinyl is not the same as their industry leading Ceramic Pro 9H or the Light product. 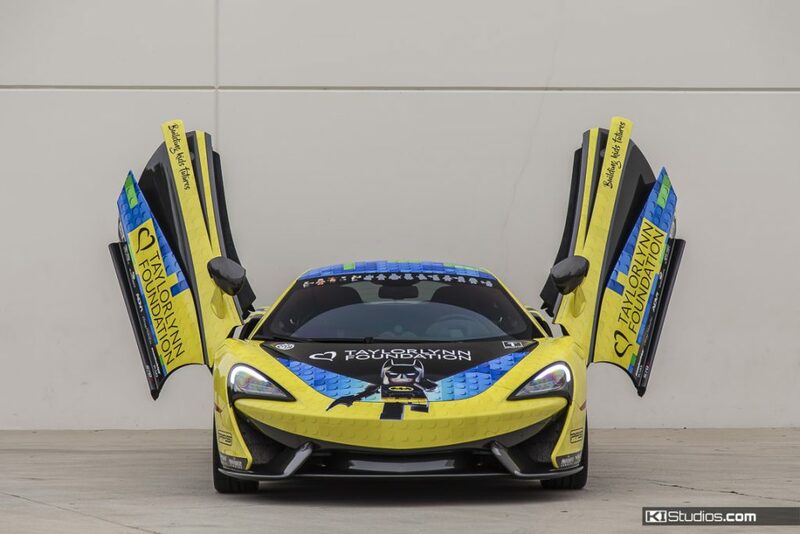 This formula has been completely reengineered to bond with paint protection film and wrap vinyl. It adheres better to films and is better suited than the original Ceramic Pro 9H for any kind of vinyl protection work. The bottom line is that Ceramic Pro will increase the lifespan of your car wrap under any circumstance. Ceramic Pro protective coating is so advanced due to constant extensive testing and improving by their team of chemists who developed the unique ceramic molecular compound formula specifically for automotive wrap vinyl use. This ongoing lab work ensures new and improved versions to keep them the leading brand in the coating industry. Properly installed, Ceramic Pro PPF & Vinyl creates a protective barrier against the elements of our harsh desert environment and daily driving exposures to contaminants. It’s easy to maintain and even easier to clean. We are happy, proud, and honored to be an approved applicator of this amazing product. The moral of the story is to trust the experts, but don’t believe everything you read/hear. Do your research and read the fine print! Know how long a car wrap lasts and how to extend that number before you commit to wrapping your car.